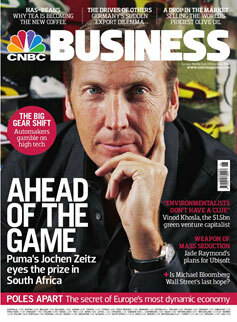 CNBC BUSINESS magazine is the flagship publication of the recognised leader in business and financial news. Published out of London, CNBC BUSINESS magazine reaches an investor audience of over 650,000 through a distribution network of international newsstands, airline business cabins, business hotel chains and financial institutions. It enjoys a privileged distribution at high profile global conferences such as the Davos World Economic Forum and is sent directly to the CNBC Global Leaders List reaching the CEOs of the world's top 1000 companies based on dollar turnover, amounting in total to $22 trillion. CNBC Business is a monthly business magazine that covers – and discovers – the most interesting entrepreneurs hatching the most innovative business models within the most dynamic sectors. From Apple to Zecco, we have reported on a huge array of gamechangers during the past few months and have carried exclusive interviews with green investment guru Vinod Khosla, Juno founder Chris Hughes, Foursquare's Dennis Crowley, PayPal and Slide.com's Max Levchin, Layar co-founder Maarten Lens-Fitzgerald, Y Combinator's Paul Graham and Seedcamp's Saul Klein. Whether it is Dimitry Kotenko, who is trying to make Siberia into a leading solar powerhouse, or Saad Mohseni, who is piping TV talent shows into houses in Afghanistan, CNBC Business talks to the headline-makers before they make the headlines. And just as important as unearthing business talent, we identify the next business hotspots. We have looked at the future telecom giants of the emerging markets, the various attempts to clone Silicon Valley, and the most creative business hubs in Europe. Rounding out each issue of the magazine is the Pursuits section, which informs readers on ways to enjoy their downtime, with hotels, motoring and gadgets reviews and sports, culture and style crib-sheets. With such a focus on innovation, enterprise and investment, delivered in print and online, CNBC Business delivers the link to – wherever you are. 65% onboard First & Business Class and in the airport lounges of 40+ airlines, including Air Canada, British Airways, Gulf Air, JAL, Lufthansa, Qantas, SAS, SAA, Swiss, TAP, TAM and United Airlines. 10 % + in major relevant events, exhibitions and conferences including WEF Davos, MIPIM, Expo Real, Sopos, World Money Show, World Travel Market. CNBC Business Global Leaders Controlled Circulation is a segment of our distribution reaching the 1,000 most senior CEOs of the world's top 1,000 businesses (based on company turnover). This business elite runs companies with a combined turnover of $22 trillion; they receive CNBC Business to read in the comfort and convenience of their offices. CNBC Business is read by over 670,000 affluent and influential opinion formers each month for its unique take on the innovators and leaders in the most dynamic business sectors. Affiliated to CNBC Television, the world's largest financial news channel, the magazine is read by CEOs, managing directors and other decision makers across the globe. CNBC Business has a seven-year track record as one of the most read international monthly business magazines. Far from rubber stamping business as usual, it has always encouraged the game changers, the entrepreneurs and the champions of global free trade. Partnered with leading global financial news broadcaster CNBC Televison, the magazine prides itself on being both a leading business media property and a fine read. Australia & NZ, Austria, Belgium, Croatia, Cyprus, Denmark, Estonia, Finland, France, Germany, Hong Kong, Hungary, Iceland, Italy, Japan, Latvia, Lithuania, Luxembourg, Malta, Middle East, North America, Canada, Norway, Poland, Portugal, Russia, Singapore, South Africa, Spain, Sweden, Switzerland, Taiwan, Turkey etc. CNBC Business reaches senior decision makers and buyers attending the many shows held throughout the year. We ensure that the magazine is found at the key events below and we are proud of our continued association with them. With distribution in First and Business Class of over 40 airlines including, Air France, BA, Lufthansa and Emirates, at major international Conferences, , in airport lounges and select hotels, we can guarantee that our readers are ABC1, travelling, or planning future travel. Our readers are senior decision makers. With our unique distribution directly targeting them and their travel patterns you have access to those who dictate and influence corporate strategy. We directly distribute to the 1,000 most senior CEOs of the world's top 1,000 businesses. CNBC, First in Business Worldwide, is the leading global broadcaster of live business and financial news and information, reporting directly from the major financial markets around the globe, with three regional networks in Asia, EMEA and the United States. Drawing on programming from Europe, the Middle East, the US and Asia, CNBC provides the perfect 24-hour global business briefing. CNBC's mission is to provide insightful and informative commentary, CEO interviews, analysis and real-time data. This, combined with its highly experienced presenters and journalists, make it an unmatched product. Available in approximately 400 million households worldwide, CNBC has three English- language regional business networks based in Europe and the Middle East, Asia and the US, offering a powerful combination of global and regional business power, with local expertise and relevance. The EMEA region alone accounts for more than 130 million homes. In EMEA, CNBC is the only real-time, pan- regional business and financial news network dedicated to CEOs, senior corporate executives, the financial services industry and investors. Across EMEA, CNBC is also available in the majority of four- and five-star hotels and directly on the floors of the region's major banks and financial institutions. The CNBC global network is owned by NBC Universal, one of the world's leading media and entertainment companies in the development, production and marketing of entertainment, news and information to a global audience. NBC Universal owns and operates a valuable portfolio of news and entertainment networks, a premier motion picture company, significant television production operations, a leading television station group and world-renowned theme parks.